Don't miss this book, it is selling all over the world. It makes people think like nothing has in years. This book shows what is wrong with our legal system and how to fix it. The Legal Model is explained. Explores America's legal heritage. Discusses the difference between higher law and man-made law, and the connection between law and economic prosperity. Introduces the Two Laws: (1) Do all you have agreed to do. (2) Do not encroach on other persons or their property. The book also sheds light on the cause of the turmoil in East Europe, Russia and Asia. 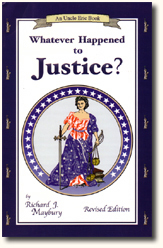 You will be amazed at how much you understand after reading Whatever Happened to Justice.